What might have been our Indian Summer occurred this past weekend into Monday, with a high temperature near 60 degrees Fahrenheit Monday afternoon. That same day the Asian ladybird beetles were out in full force, although their annual fall flight did not last long. Since Monday, the high temperatures have once gain been in the low to mid-40’s, and another half inch of rain has fallen. The forecast for next week again looks rainy and cool. Just about all the plants have finished flowering, although there are still a few residual New England Asters that appear to be staunchly defiant of the unseasonably cold weather. Most of the trees, including the oaks and lindens, have begun to show fall coloration, and many of the maples are now looking rather bare. 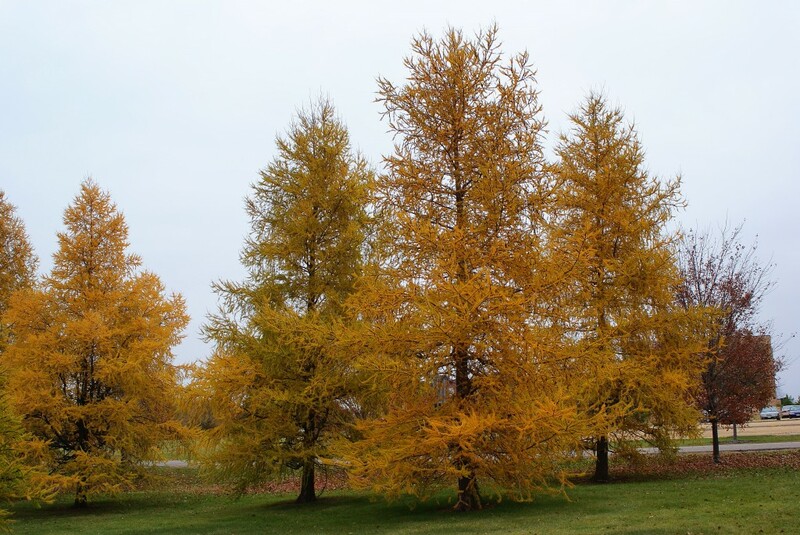 The tamarack plantation near the Jim Gilbert Teaching Pond is exhibiting its classic fall “smoky gold” coloration; these trees are among the most beautiful in fall. Tamaracks near the Jim Gilbert Teaching Pond, 10/20/09. Beautiful tamaracks. That was a fun day!